You will not want miss out on this fun event with Mr. Edwards, Mr. Godleski, and Coach Swain serving as Masters of Ceremonies. It’s going to be F-U-N, FUN! The entire Claxton community – parents, guardians, grandparents, teachers, and staff – is invited to celebrate and support Claxton School at the Night at the Museum Auction! Please join us for the most fun party of the year at the Asheville Museum of Science (AMOS) on March 29th from 7 – 10:30pm. This is our PTO’s largest fundraiser. Reserve your tickets below and then be sure to check out our Facebook event page HERE to catch a glimpse of some of the awesome items up for bidding and stay posted about updates! Proceeds from this event go toward many programs at Claxton such as the Playground Project, LEAF in Schools and Streets, Claxton’s Storytelling Festival, teacher mini-grants, field trip scholarships, books and supplies for classrooms, and more. Profits from the auction greatly enhance the school’s Arts and Humanities magnet theme; and generous donations from businesses, groups, and individuals in our community enable us to continue these wonderful programs at our school. For inquiries or auction item donations, please contact Lisa Manning at ManningLA@yahoo.com. We have a limited number of auction tickets available, so make plans soon to join us for an evening of fun! Tickets are available online until we sell out or until 12pm on March 29, whichever comes first. If tickets remain, they can be purchased at the door that evening. 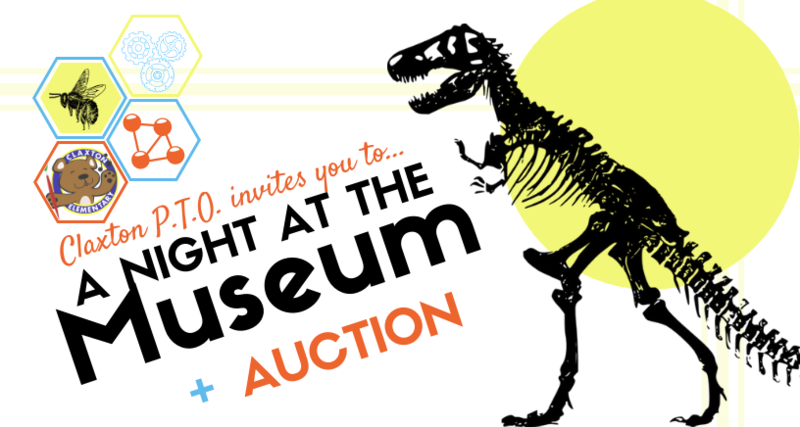 Purchase your tickets HERE for our 2019 Claxton Auction — A Night at the Museum! Or maybe you want to bid on additional items or donate to Claxton programs? You can participate through our online auction! The online auction on Bidding Owl will open on Monday, Mar 25 HERE. We welcome DONATIONS of any amount. All funds go to support our school! Please click here to share a donation. Claxton Staff—Tickets are available here.